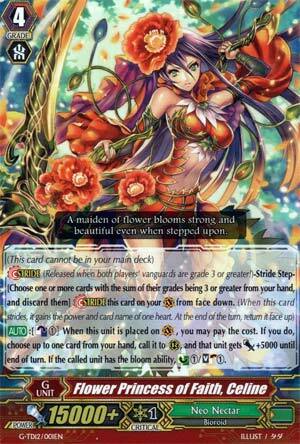 (This card cannot be in your main deck) [Stride] (Released when both players' vanguards are grade 3 or greater! )-Stride Step-[Choose one or more cards with the sum of their grades being 3 or greater from your hand, and discard them] Stride this card on your (VC) from face down. (When this card strides, it gains the power and card name of one heart. At the end of the turn, return it face up) [AUTO]:[Counter Blast (1)] When this unit is placed on (VC), you may pay the cost. If you do, choose up to one card from your hand, call it to (RC), and that unit gets [Power]+5000 until end of turn. If the called unit has the bloom ability, Counter Charge (1)/Soul Charge (1). Another basic, but not great card. Celine calls a unit from the hand upon being played for Counterblast 1, gives it 5k, then if you called a unit with Bloom, Soulcharge 1 and Countercharge 1. So basically budget Verano, existing pretty much to give Ahsha a card to clone in the even of total board-wipe. But since I'm trying to be general here I'll assume youcan find and afford Verano who is better in basically every way that matters and leave it at that. Another good utility first Stride. Most of the time, Celine is gonna refund her counterblast cost since there's not many non-Bloom cards you're gonna be running come March. Since her effect is on-Stride, you can use Celine first, then clone whatever she called with either Ahsha's on-Stride skills. She's good and straightforward. There's not much else to say. Shouldn't need more than 1 copy.